Traveling across the country in a luxury RV, headed to a state park with your pop-up camper, or taking your horses to show, Boeshield T-9® is with you for the long haul. On the road or in storage, on large surfaces or inside the smallest spaces, even on slide outs, jack stands and steps, T-9 provides quick, easy lubrication and superior, long-term protection. The unique waterproof formula reaches deep into metal pores to displace moisture and stop corrosion, then dries to a clean waxy film that lubricates and protects for months. 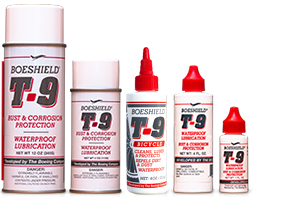 Use T-9 safely on all kinds of metals without harming paint, plastic, rubber, fiberglass or vinyl. This video shows you how.